Mrs Chan was left bleeding profusely after a python bit her on her left leg. SINGAPORE - It was around 4am on Tuesday (Oct 9) when Mrs Chan Yin Ha was looking for her cat on the second storey of the Sembawang Drive Housing Board block she lives in. As she searched among a row of potted plants, she suddenly felt a sharp pain in her left leg. Thinking her cat had scratched her, she kicked out instinctively and looked down. It was then that she saw what bit her was a 3m-long python. The 42-year-old store assistant, who is afraid of snakes, told The Straits Times that she "freaked out" when she saw the python. "I thought it would coil around me," she said, adding that she was terrified and immediately ran away from the snake. Fortunately, the snake did not pursue her. Mrs Chan then ran to her neighbour's unit to get help but nobody answered the door when she knocked. She then returned to her third storey home, bleeding profusely. Her family members helped her wash her wounds and called for an ambulance. The Singapore Civil Defence Force said that it received a call for assistance at 4.04am in the area. Mrs Chan's neighbour on the second storey eventually opened the door after she had already left, and the neighbour found her slipper at the doorstep and a trail of blood along the corridor, Chinese evening daily Lianhe Wanbao reported. Thinking that there had been a fight, the neighbour called the police. When the police arrived, they followed the trail of blood to Mrs Chan's residence, where they were told about the python. Mrs Chan said that the police then called a pest control agency for assistance. 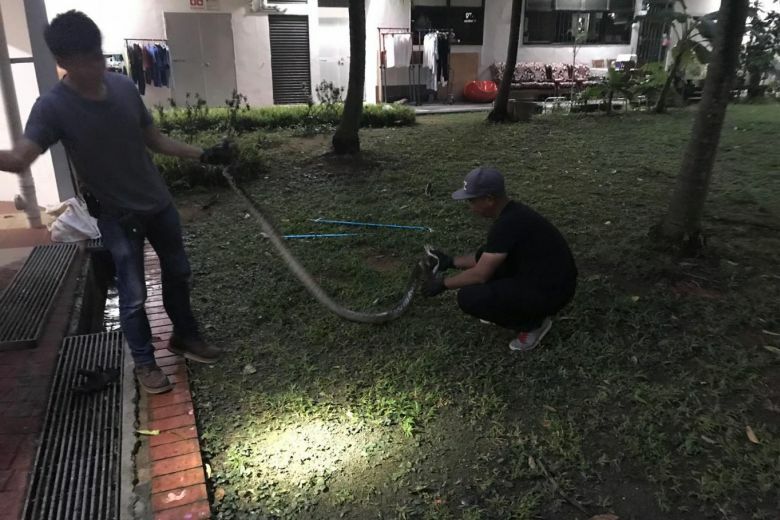 According to Wanbao, the python retreated into a water pipe. The pest control agency later arrived and poured hot water into the pipe to force the snake out. 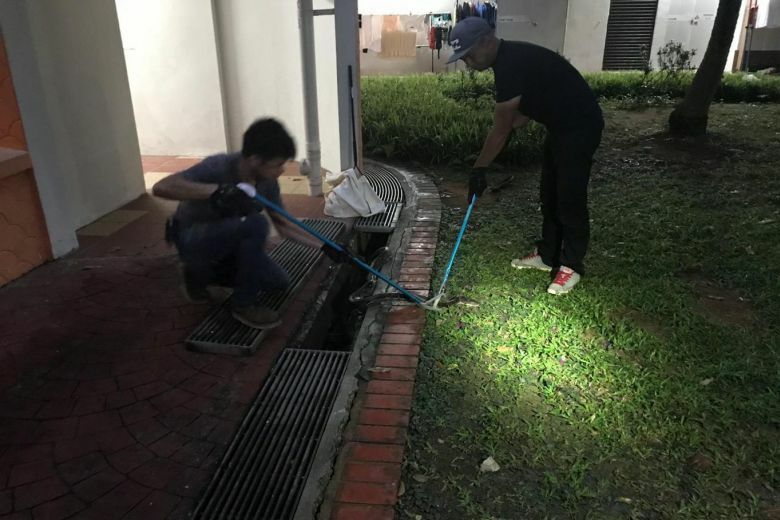 The snake fled into a drain on the ground floor, where it was caught by the agency. Mrs Chan told ST that she was taken to Khoo Teck Puat Hospital, where she received stitches and was placed under observation for a few hours. She was later given four days' medical leave and is now recovering. The store assistant said that this is not the first time a snake was spotted near her home. 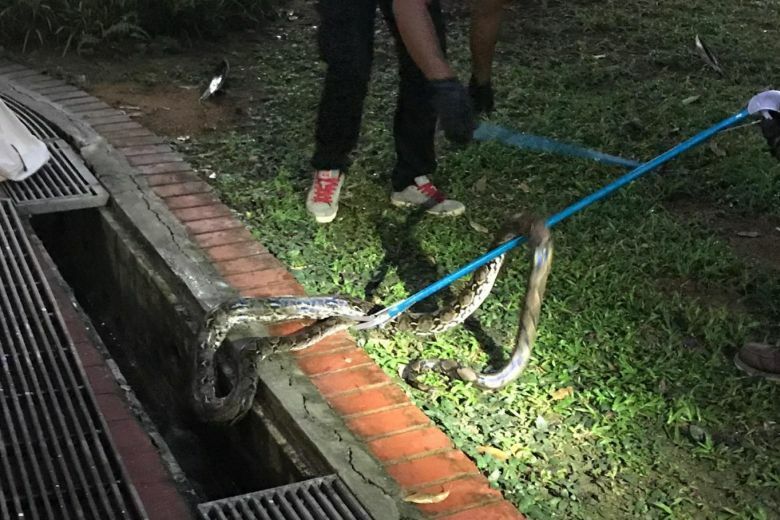 Mrs Chan said that in 2016, she encountered another snake in the drain on the ground floor of her block. At the time, she spoke with the town council, which called in a pest control company to remove the snake. She also gave feedback to the town council following the most recent incident. Mrs Chan said her cat eventually returned home safely. Noting that there is a forested area near her housing estate, she added that she would try not to let her cat out of the flat too often as she fears for both its safety and hers after the snake encounter.